Catherine Rogers has a Diploma of Graphic Design from Sydney Technical College, Graduate Diploma of Art (Photography) from Sydney College of the Arts, Master of Fine Art from University of South Wales and PhD in Communication and Media from University of Western Sydney. She has been exhibiting her work since the mid-1970s, continuing to augment it with research and publications on photographic history. In ‘The culture of the table’ Rogers rediscovers the camera as a method for abstracting the ornamental potential of functional domestic objects. Exaggerating 17th century still life techniques, Rogers teeters her objects awkwardly on the corner edge of the table – fantasising on the edge of impossibility as once, only painters could do. Rogers’ interpretations specialise in finding the eerie boundary line between real and unreal. Rogers’ series also acknowledges the first published photographic still life, William Henry Fox Talbot’s ‘A Fruit Piece’. 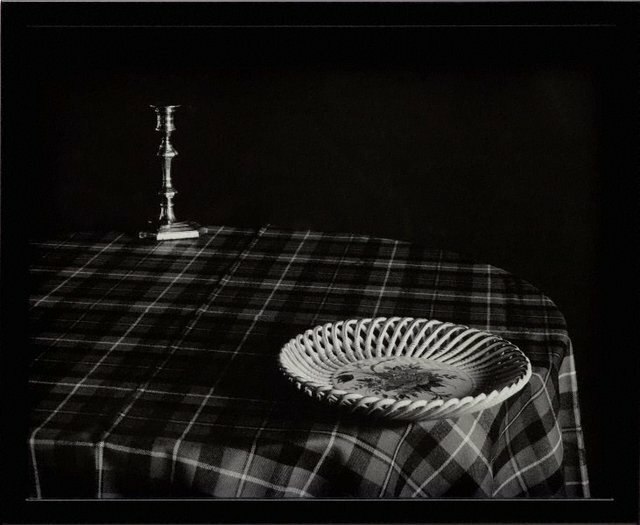 This image, the final image in ‘The Pencil of Nature’, used a tartan cloth to test the light-responsiveness of silver-salts on a monochrome photograph, simultaneously rendering perspective. Rogers’ use of tartan in ‘The culture of the table’, gestures to this moment in photographic history, when Talbot realised that his silver-salt mixture was more sensitive to the ultra violet light than red – and therefore inappropriate for recording a monochrome world. ‘The culture of the table’ also refers to Talbot’s more successful use of the light-sensitive silver mixture with the ‘camera obscura’ and objects of breakfast still life. Rogers’ rearranges candlesticks, plates and cups in tribute to experiments such as Domestic ‘Interior Study’ where Talbot played with the camera’s sense of multiple dimensions and that which is ‘seen’.